Euglena gracilis Z requires vitamins B1 and B12 for growth. It takes up and accumulates large amounts of these exogenous vitamins through energy-dependent active transport systems. Except for these essential vitamins, E. gracilis Z has the ability to synthesize all human vitamins. 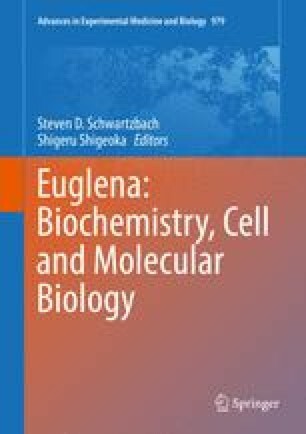 Euglena synthesizes high levels of antioxidant vitamins such as vitamins C and E, and, thus, are used as nutritional supplements for humans and domestic animals. Methods to effectively produce vitamins in Euglena have been investigated. Previous biochemical studies indicated that E. gracilis Z contains several vitamin-related novel synthetic enzymes and metabolic pathways which suggests that it is a highly suitable organism for elucidating the physiological functions of vitamins in comparative biochemistry and biological evolution. E. gracilis Z has an unusual biosynthetic pathway for vitamin C, a hybrid of the pathways found in animals and plants. This chapter presents up-to-date information on the biochemistry and physiological functions of vitamins in this organism.